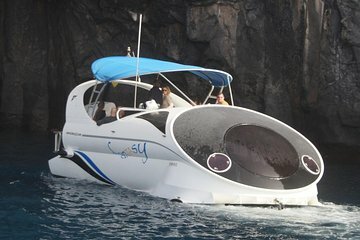 Cruise around the island of La Palma on a glass-bottom boat tour limited to 10 passengers. You'll have the chance to see marine life like whales and dolphins and enjoy views of cliffs, beaches, and island villages. VIP drinks and snacks during the whole trip: Fresh fruits assortment, water and soft drinks, beer, cava cup, cheese and sausages table, garlic and parsley bread toasts, chips. There is no minimum age to do this activity. The activity is subject to weather conditions, so it could be postponed or cancelled if weather conditions so advise. It is recommended to bring: camera, binoculars, sunglasses, sun cream and/or cap (depending on the time of year), swimsuit, towel in case you feel like a bath (depending on the time of year), coat or windbreaker. We have blankets at your disposal. If you get dizzy, please take precautions before leaving.